It's been a joy watching the young Bryant Huggins grow into the Mayor of Duff City himself, Rise|Smug. 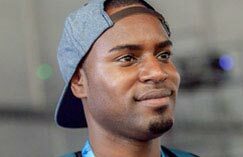 Not only has Smug continued to mature as one of the most entertaining competitors in the tournament scene, but also as one of the most entertaining streamers in the more relaxed and casual environment. I may be preaching to many in the choir here, but those of you who haven't seen much of Smug's live stream, SmugDaBeastTV, have been missing its wonderful blend of impressive play and hilarious antics, like this one that recently happened during a bout with a Diamond-ranked Necalli player. Despite being blind, BlindWarriorSven is a Street Fighter 5 player that has made a name for himself by competing at tournaments. He has previously praised Capcom and Street Fighter 5's sound design for making this possible in the first place. Although the odds may seem stacked against BlindWarriorSven when it comes to achieving an excellent rank in online play, he has managed to boost himself to Super Diamond rank with Ken. Zeku hadn't made a gigantic splash in the Street Fighter 5 scene, but that looks like it's going to be changing now if NASR eSports's AngryBird has anything to say about it. Released in October 2017, back in Season 2, Zeku has definitely seen some great placements — but it looks like in Season 4, this is going to be his biggest time to shine so far. Let's recap some of the outstanding play we saw at Brussels Challenge Major Edition 2019. Brussels Challenge Major Edition 2019 took place this weekend, so we gathered the stats for how the top 48 portion of things shook out for the Street Fighter 5: Arcade Edition competitors. Karin has been seeing very strong results early on in Season 4, and this tournament was no exception, as she was the most used character by a fair margin. Capcom is still steadily releasing new crossover costumes for Street Fighter 5: Arcade Edition — even if that's pretty much the only thing they've released for the game in 2019 — and they've started really digging into some of their lesser known properties as fan service for their catalogs from the past. Alex finally got his time in the spotlight by receiving his first crossover look by dressing up as the oft forgotten fighting game Red Earth's Leo, and that new lion-headed outfit is now available to use in SF5 — unless you're like me and missed a week of missions because I forgot. The online portion of this year's Capcom Pro Tour is a bit different than what we've become accustomed to, but it's kicking off this weekend nonetheless. This first installment will be the South East Asian part, and some of the players set to compete are RZR|Xian, Chuan, TJ|MindRPG, SIN|Brandon, OswaldAce, and many more as well. Studying the meta of Street Fighter 5 has become an intense hobby of mine. The concept of risk vs. reward in this title is so crucial to successful gameplay, yet it's a subject I rarely hear about from the community at large. While previous Street Fighter titles were often about minimizing risk, and never opening yourself up to danger, SF5 is often about embracing that aspect of the game, as the rewards for doing so at the correct times are exceptional. Street Fighter 5's implementation of Fight Money was among its most bold and interesting choices in the current landscape of video games allowing players to earn typically paid content through playing the game as incentive to keep people coming back and trying out the game's various modes. That system has essentially eroded, however, over the past year or so even though Capcom has added more ways to spend Fight Money than to obtain it, and things don't appear to be changing any time soon. Does Street Fighter 5 need a Season 4.5 balance patch, is Capcom showing signs of better communication, and just how good or bad is G? While it had a fairly rocky start, it seems Street Fighter 5 has fallen a bit more into the good graces of fans now that the 2019 Pro Tour has started and Yoshinori Ono has broken Capcom's radio silence and offered the community a feeling of acknowledgement. In both 2017 and 2018, it was around this time of year that we got a mid-season balance patch, but is that some we should expect or even want here in Season 4? After a long journey burdened by trials and tribulations, Mike Watson was finally able to re-open the doors of Southern California-based Super Arcade on April 5th, 2018. It's hard to believe it, but we're now on the verge of celebrating the one year anniversary of this oh-so important and integral establishment for America's modern fighting game community. As such, Super will be hosting an anniversary event this Friday, April 5th, to show its appreciation for any and all who have darkened its doors or monstered its streams, and it looks to be a very good time. UDON Entertainment has a long-standing relationship with Capcom and their fighting game franchises considering they've been in charge of a multitude of comic book runs for the Street Fighter series as well as produced special art collections like their "Summer Sports" issues. The publisher is keeping that tradition alive and well with their recently revealed Street Fighter Pin-Up collection featuring the world warriors in their Summer attire including bikinis, swim trunks, gym clothes and even wedding dresses. Another week in the life of professional fighting game players wrapped up at NorCal Regionals 2019 last weekend, but many won't get much of a chance at rest with Brussels Challenge Major Edition starting up tomorrow showing off the mental fortitude needed to continually do well and improve with such little time in between majors. CYG|Daigo Umehara and ROHTO|Tokido are often regarded as some of the mentally strongest and smartest competitors currently in the game, so it's really cool to see what is going on in their heads moment to moment during one of the most heated matches of NCR.